Prof. Jae Sung Lee's team found a 2nd generation's artificial leaf. A cheaper, more stable, and more efficient photocatalyst is developed at UNIST. Prof. Jae Sung Lee’s research team (School of Energy and Chemical Engineering) found a new type of artificial leaf that produces Hydrogen (H2) when it absorbs sun light in the water. This research started with the basic concept of photosynthesis. Plants absorbs water with the roots and Carbon Dioxide (CO2) with its leaves. 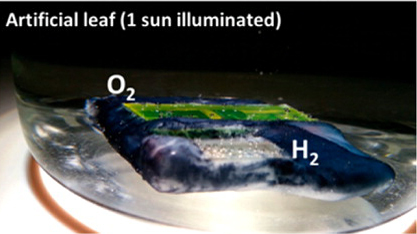 The leaf splits water into O2 and H2 by absorbing sun light and it emits O2. At the same time, the leaf lets H2 combine with Carbon (C) in order to make nutrients. Surprisingly, UNIST research team discovered the artificial leaf that splits water into H2 and O2 by using sun light as the same way as the actual leaf does. It is the monolithic device which is combined with the solar battery and the photocatalyst as one. Also, it is the advanced version of existing artificial leaf with a significantly increased efficiency. Prof. Lee’s team used the dual-doped BiVO4 as the photocatalyst because it is comparatively inexpensive, stable, and ecofriendly. Furthermore, using this catalyst elevated the performance by doping 2 types of element and adopting Cobalt as the promoter. The photocatalyst plays the role of absorbing sun light and Perovskite solar cell gets attached as the supplementary battery. The new type of artificial leaf can lower the production cost since it is the double junction that uses a photocatalyst electrode and a solar battery. The newly developed artificial leaf is the wireless single junction. It is very similar to the actual plant’s photosynthesis which is the best energy absorbing and storing method in the nature. The conversion efficiency of sun light is 5 % and it is higher than the existing artificial leaf (3%). Generally, the necessary efficiency for practical development is 10 % and this research will make the important turning point. This research has been introduced on ACS Nano which is issued by the American Chemical Society and sponsored by Korea Center for Artificial Photosynthesis, Ministry of Science, ICT and Future Planning and Ministry of Trade, Industry and Energy.